This is the BIG BOY, delivering powerful, clean, efficient, radiant heat and requires no electricity. It is easy to start and operate and will satisfy large heating needs. The heater operates on readily available diesel fuel. The Prospector is robustly built for reliability and durability. The heater uses a vaporizing burner and is controlled by a fully adjustable fuel regulator. The heat output can be adjusted from 20,000 BTU/h to 50,000 BTU/h (approx 2 liters/hr) of diesel fuel consumption on high. The Prospector also includes multiple operational safety features such as a patented, non flooding burner, fuel regulator overheat protection, fuel shutoff valve and side lighting port. These natural draft heaters are rugged and extremely safe, easy to operate, and burn extremely clean with no smoke or smell. A galvanized heat shield is attached to the heater to protect the user from incidental contact. 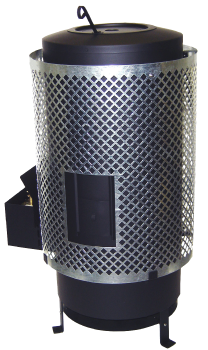 These non-powered diesel space heaters are being used in mining camps, construction sites, agricultural buildings, homes, cottages, workshops and garages, ice fishing shacks. note: General guideline for portable structure/building with 8 foot ceiling. Other factors like quantity and size of windows and exterior walls will affect above numbers. To see our line of electric diesel Toyotomi heaters click here.